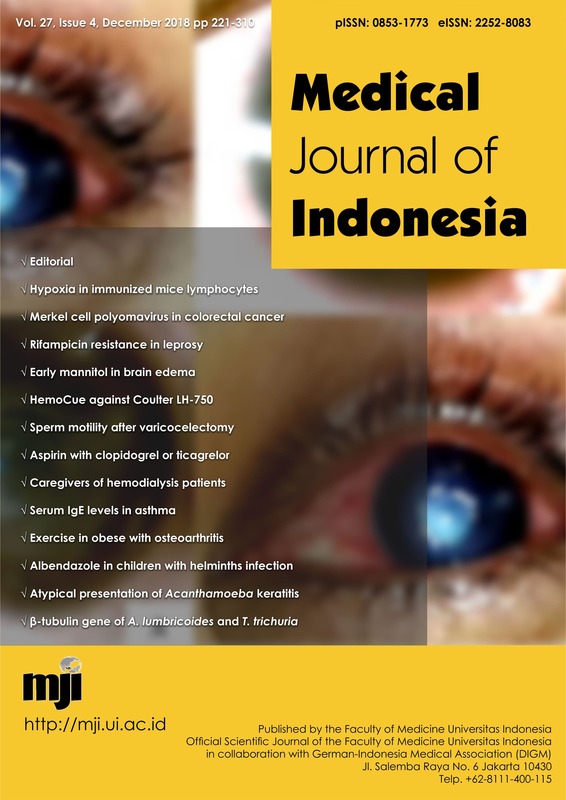 This quarterly medical journal is an official scientific journal of the Faculty of Medicine Universitas Indonesia in collaboration with German-Indonesian Medical Association (DIGM). Abstracted and indexed in: EBSCO host, ASEAN Citation Index, BASE, CAB Abstracts, CiteFactor, CNKI, Dimensions, DOAJ, Electronic Journals Library, Embase, ESCI, GARUDA, Global Health, Google Scholar, Hinari, IMSEAR, ISC, JournalTOCs, Microsoft Academic, PKP index, Proquest, Scilit, Scopus, SINTA, Ulrichsweb Global Serial Directory, WorldCat. Accredited (2016-2020) by the Directorate General of Research and Development Strengthening of the Ministry of Research, Technology and Higher Education of the Republic of Indonesia (No:21/E/KPT/2018). Cover letter is needed and addressed to Editor-in-chief which should contain statement about all previous submissions of the manuscript and previous reports that might be regarded as redundant publication of the work and mention whether the work have been presented in a congress. We encourage authors to register all clinical trial to any registration and if you can not provided, you need to explain it also in the cover letter. Funding sources need to be written separately. Abstract in Indonesian language and synopsis are no longer needed. Start from 2019, all authors will be written completely without any abbreviation. The complete address of the corresponding author (include full address, tel/fax number of the institution) will also be printed. For complete instructions please see it here.